Technology faculty continually look for ways to combine coursework with real world applications. For example, at the end of the semester of Scripting II (CS 115), students are tasked with creating a program that solves, or can be applied, to a real world problem. 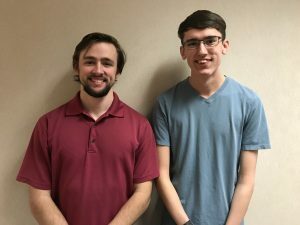 SITC students Matthew Middlebrook and Brighton Mica decided to create a program that could beat the game Minesweeper. Minesweeper is a single-player puzzle video game where the objective of the game is to clear a rectangular board containing hidden mines or bombs without detonating any of them. Players receive help from clues about the number of neighboring mines in each field. As you can imagine, this was no easy task as they set out to beat a computer at a game that is difficult for most people to win. Middlebrook and Mica had some doubt at the beginning of their endeavor, due to the sheer amount of work involved and wondering if it could even be done in the scripting language. However, using the tools they hadlearned from Scripting such as lists to store the game board, complex functions, and if statements they were able to start planning out a program. eference images. While the solution did work correctly and was very accurate, it turned out to be a very slow method. Middlebrook’s solution was to get the coordinates of the game window and use some math to try and figure out where the spaces on the board were located. It took a long time to compile and figure out the correct positioning of everything, but this method turned out to be the fastest. Even though this idea was much more prone to error, especially if the window moved or resized, the pair decided to go the route of the most efficient method. Because this was such a complex program, the students also had to teach themselves some things that had not yet been covered in classes, such as opening a program. Through this research they learned enough to be able to write a working code. Mica and Middlebrook were able to write the program and win the game a majority of the time in around 2-3 seconds. Writing such a complex program was well beyond what was expected but the pair says they were inspired by the difficulty of the game and wanted to find a way to beat Minesweeper, achieving their goal and presenting an excellent final project for Scripting. We’ve all heard about Disney magic. Lauren Mullen, a sophomore Digital Entertainment Technology major, got to experience that magic first hand when she participated in the Disney college program during the 2017 spring semester. The Disney College Program gives college students the opportunity to work in the Disney parks and resorts while participating in college coursework. Participants are given the chance to meet students from all over the world who have similar aspirations as well as learn the Disney principles of leadership and customer service skills that can only be learned through this unique experience. 44,000 people apply for the internships and only 4,000 applicants are accepted into the program. At Disney, Lauren interacted with college students of all majors and with people from around the globe. “The opportunity that Disney gives people is incredible,” says Lauren. “Even if you are not interested in a career at Disney, it is impressive to have on your resume because it demonstrates the amount of work and ability you have.” She recommends other students to apply for the internship because it has the potential to shape your life and career in a dramatic way. 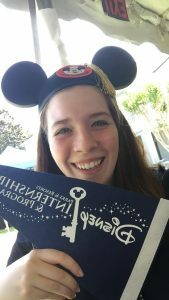 Lauren heard about Disney College Program when she was in middle school and it had been something that she had wanted to do since then. She went online to the Disney College Program website and signed up for an email list to get notifications about job opportunities. When she received an email about the semester program, Lauren almost immediately applied. After thirty minutes, she heard back from Disney and was asked to take a test about her knowledge of Disney and her priorities as a person and employee. After passing the test, she had a phone interview and was finally hired for a position at one of the restaurants in the Magic Kingdom. Lauren’s average day in the Magic Kingdom can be described as very busy and very exciting. In the morning, she dressed in her costume and checked the Disney database to view her responsibilities, the time she worked, and how many people were expected in the park that day. She would leave from her home and drive twenty minutes to get to the park, where she caught a bus from the employee parking lot to Magic Kingdom. The bus dropped her off at the first floor of Magic Kingdom, which is actually underground because the park was built on the second floor. She would go to her locker, clock in, and check in with her boss. Her days ranged from eight to twelve hours. Lauren’s favorite days were the twelve hour days because she could watch the fireworks while shutting down the restaurant and, if she got off early, she could go into the park and play until it closed. One of Lauren’s biggest takeaways from her time at Disney was learning the value of hard work. There were some days where she was filled with doubt about why she was there. She would remind herself that this was an opportunity to work for Disney and show them that she was a hard worker; that, when faced with obstacles, she could push through it and demonstrate her commitment. Lauren says that Disney was able to teach her how to make the “magic” for the most people. For example, one way Disney provides magical moments is by giving employees little things to give to their guests such as fast passes to a ride or food. Through simple acts like that, Lauren was able to spread joy anytime she worked. The experience of working for Magic Kingdom was also beneficial because Lauren was able to see the inner workings of Disney: the behind-the-scenes on making magic happen. While there ,Lauren took classes on the history of Disney animation. Animation is a field that Lauren is very interested in and working there gave her the opportunity to ask questions and learn the Disney art of animation. Because of the heart and happiness that she showed on the job, Disney asked her to stay on longer to work for them. Though it was a tempting offer, Lauren said that she had to return to ACU. Overall, Disney taught her to have fun, enjoy her job and spread joy and magic to the people around her while equipping her with skills and experience to succeed in her future career. This internship with Disney is paving the path to Lauren’s future and giving her a headstart on achieving her dream job of being the first solo female director of a Disney movie. She is encouraged that because of her hard work, Disney has now taken notice of her. This Disney internship makes it more likely that she will have the opportunity to work for them in the future. For anyone interested in applying for this amazing program, Lauren’s advice is “to just go for it.” Congratulations to Lauren for being one of the 4,000 chosen for this unique program. You can learn more about the Disney College Program here.